Dapper Linux is a security hardened Linux distribution designed to be used every day. Ready to evolve to a whole new level of security? 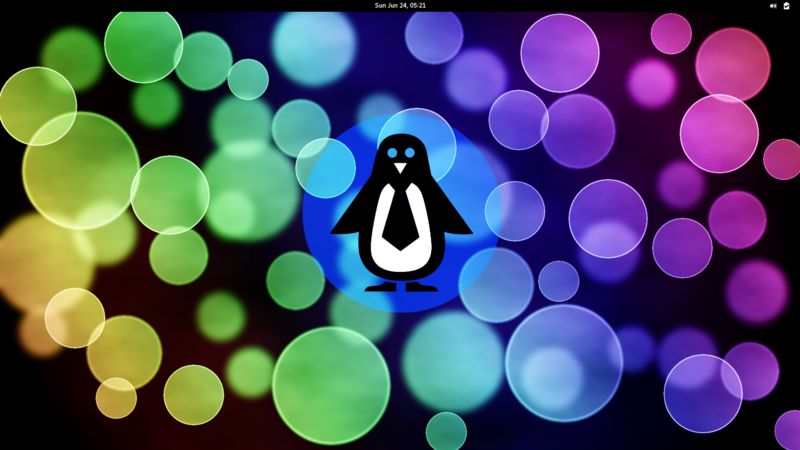 Dapper Linux is an easy to use secure operating system developed with open source principles. 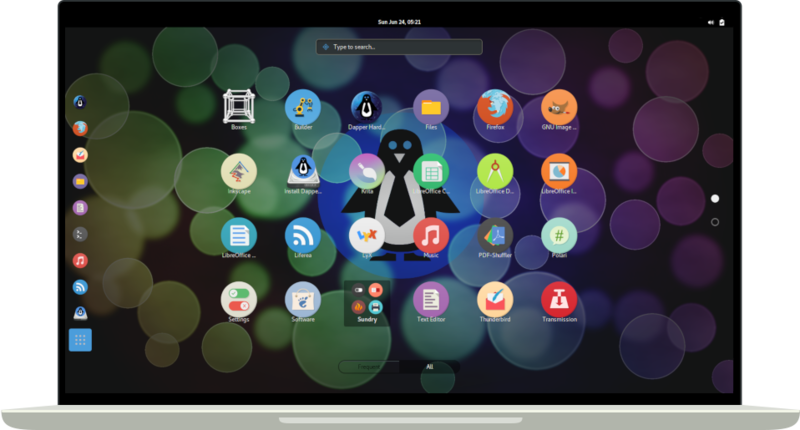 Dapper Linux has been designed to be the most secure, easy to use and elegant Linux distribution around. We take advanced security features that will define the future of secure computing, and do all the hard work packaging it up into an easy to use and great looking operating system. Dapper Linux is built on open source software. 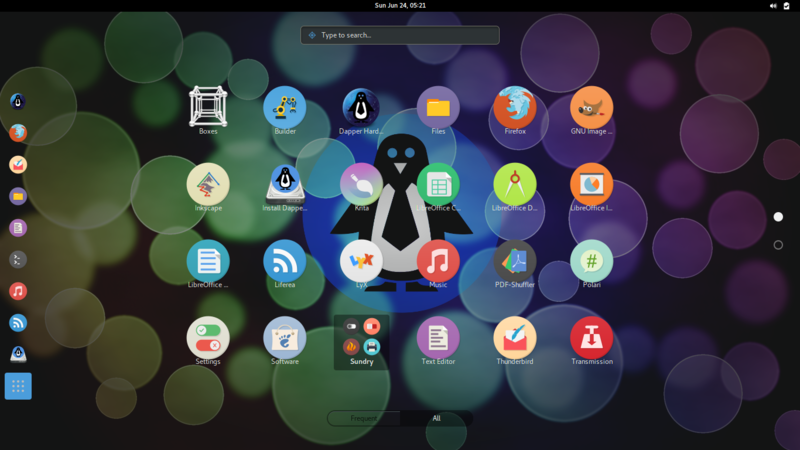 With solid foundations from being a remix of the Fedora operating system, Dapper Linux brings you a highly polished experience, and includes many great applications and media codecs out of the box. Try it today! Dapper Linux ships with a well thought out suite of packages that provide great features while still ensuring your security. Run a hardened Linux Kernel with cutting edge security improvements provided by Dapper Secure Kernel Patchset. All your graphical applications sandboxed, limiting the attack surface and increasing your security. Dual browsers enhances your privacy. Use a hardened one for daily surfing and the other for trusted activities. Be productive out of the box, with video codecs, a Latex distribution, C Development Tools and more installed. Full hard disk encryption can be enabled, ensuring your physical data security. Easy to set up during install. 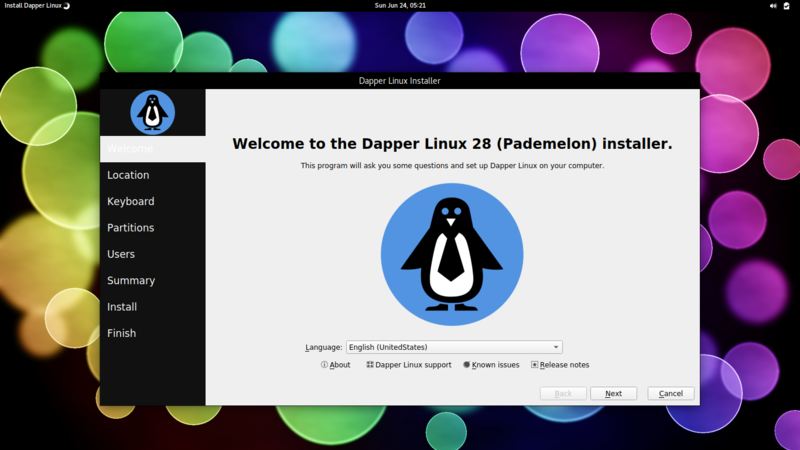 Dapper Linux installs just like any other Linux distribution, and comes with all features out of the box. 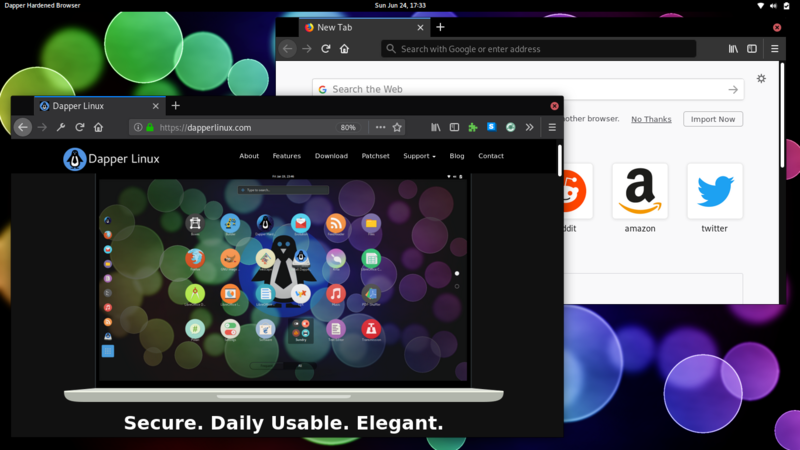 Take a look at Dapper Linux in action in the screenshots below. 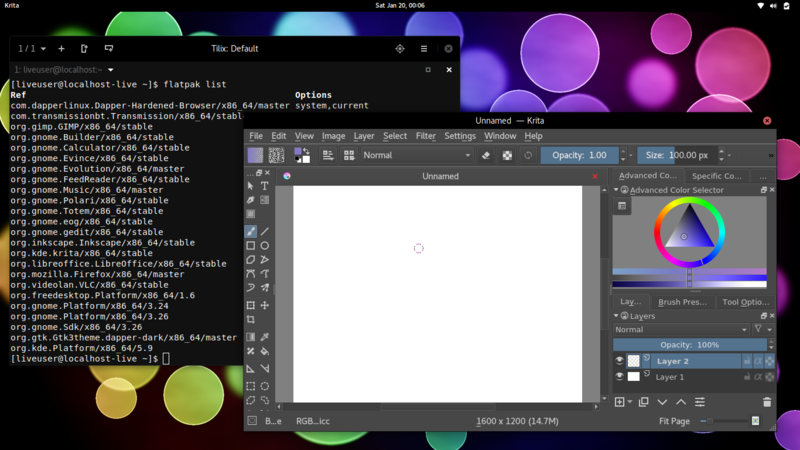 Dapper Linux was designed to have a sleek and minimalist user interface, while still being packed with features. Dapper Secure Kernel Patchset is a continuation and forward port of the Grsecurity Patchset. Dapper Secure Kernel Patchset is a continuation of the Grsecurity patchset, and is forwarded ported to the latest Linux kernel release, along with recent stable kernel releases. Dapper Secure Kernel Patchset is free and open source software, and provided to the community so they can patch and build their own hardened kernels. Dapper Secure Kernel Patchset features extensive hardening against memory corruption exploits, eliminates entire classes of exploits, hardens filesystems, and closes information leaks and insecure APIs. 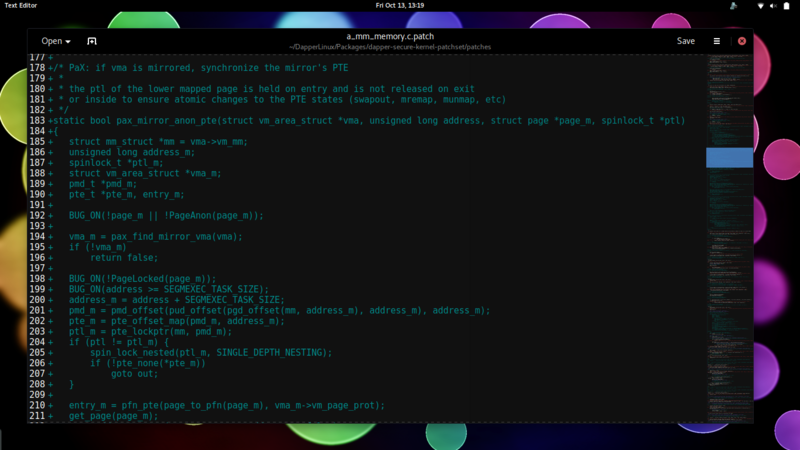 Simply patch your kernel, select your configuration and compile. Download the patchset today!